For the balsamic vinaigrette: Combine all the ingredients in a container and shake well. To prepare the salmon: Place the salmon in a glass container, season with salt and pepper and add the balsamic vinaigrette, chipotle sauce and grated garlic. Make sure to marinate both sides of the fillets, cover the container and refrigerate for about 1 hour. Preheat oven and cook salmon for 8-10 minutes, depending on how thick the fillets are or until they are cooked to your liking. Remove from oven and let cool. When the salmon has cooled to room temperature, cut into medium-size chunks. 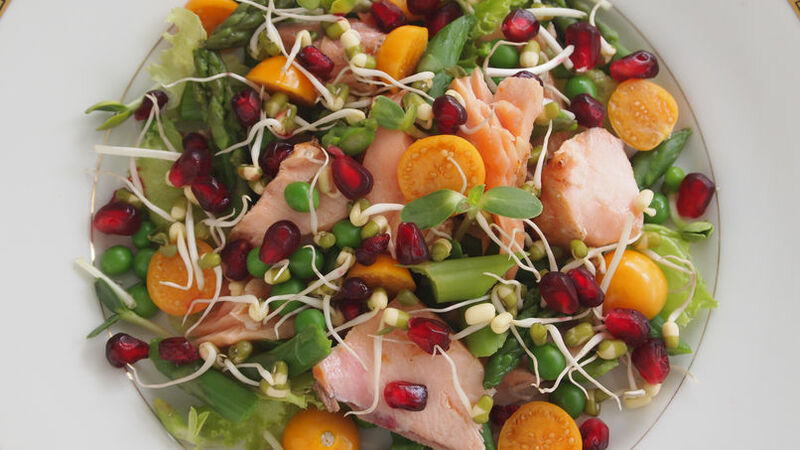 For the salad: Combine salmon with lettuce, asparagus, cherry tomatoes, peas, sprouts and pomegranate seeds. Plate the salad and drizzle with the vinaigrette just before serving. For a different presentation, serve this salad over quinoa, couscous or orzo. If you don’t want to use a balsamic vinaigrette, make one with olive oil and lemon juice. A good vinaigrette can also be a great marinade for meats and seafood. The marinating time should be less for fish and seafood because the acidity of the vinaigrette can have a different outcome on more delicate meats. For this recipe I’m using the same vinaigrette that I’ll be using for the salad to marinate the salmon, plus a touch of chipotle sauce to give it a little spiciness and smoky flavor. I also added a grated garlic clove to round out the flavor. Salmon can be marinated for up to 1 hour and it should be cooked for just a couple of minutes so the center can remain juicy and be more appetizing. This salad requires the freshest asparagus you can find, cooked just until they are tender and then soaked in an ice bath to stop the cooking process. You can make the vinaigrette ahead of time and keep it refrigerated for up to three days. Shake well before using it and it goes great with any kind of salad. Try this salad!